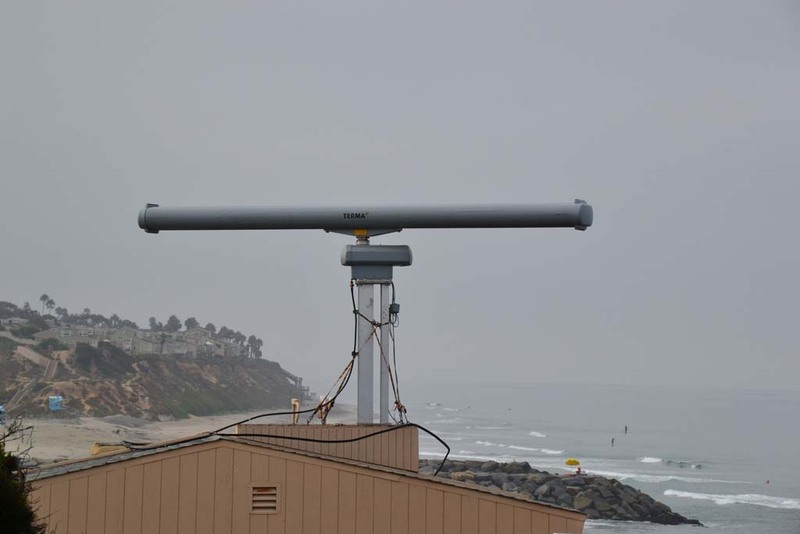 CARLSBAD — The TERMA radar that was being tested for coastline surveillance capabilities by the U.S. Customs and Border Protection (CBP) has been removed from Ponto Beach. CBP’s Air and Marine Operations Center (AMOC) in Riverside was operating the radar to experiment how the device could be used to thwart maritime smuggling and potentially collect data for the U.S. Department of Homeland Security’s pilot Coastal Surveillance System (CSS). The TERMA radar can detect objects within a parameter of over 15 miles. The device was designed to identify boats of all sizes approaching the coastline so officials can efficiently respond to smuggling attempts and other threats. The radar radiated about 200 watts of energy, which bounced off of vessels in the water or in the air, according to Keith Jones, AMOC Director of Operations. The device sends information about the location of these vessels through the CSS back to AMOC, where officials can notify law enforcement in the area, including the Coast Guard and Port Authority, about suspicious activity. With the device, CBP can monitor the coastline remotely all day every day without expensive air and water patrols. Installed in late August, the radar was lent to CBP by TERMA as part of a technology demonstration, according to Jones. CBP was able to use the device beyond its 60-day trial period, removing it on Dec. 4 and returning it to TERMA. The radar was one of multiple new and existing sensor devices being tested for its compatibility with the CSS pilot. CBP can monitor the coastline remotely using such devices and combine the different types of data collected in the CSS. Different law enforcement agencies can then access the information all in one place on the CSS, creating greater accessibility to real-time surveillance information. “We are testing many different platforms with the intention right now of ensuring the CSS architecture works properly so that already existing surveillance platforms have one system to share their information with in order to build a complete Maritime picture at little cost,” explained CBP spokesperson Ralph DeSio. Though CBP would not release specifics about the data gathered by the device, Jones stated that the TERMA radar improved AMOC’s domain awareness of the San Diego County coastline. He said that CBP is considering testing the TERMA radar in Puerto Rico in the future. The testing of surveillance devices to input data into the CSS is scheduled to conclude sometime in 2014. For security reasons, Jones would not state whether CBP is testing any other devices along San Diego’s coastline or would be doing so in the future. This article was updated from its print version in the Dec. 13 issue with information that became available after press time.